The city of Quetzaltenango, perched on its plateau surrounded by mountain ranges, volcanoes and scenic attractions, makes a great base for travelling around this scenic region. Hiking in the Western Highlands is a thrilling experience, and the little colonial towns and Mayan villages tell of the diverse cultural and ethnic heritage of the area. Whether for outdoor activities, eco-tourism attractions or a less strenuous holiday experience, this region of Guatemala makes for a unique and fascinating trip. Hiking tours, cycling excursions and day trips into the countryside are all popular with Quetzaltenango holiday makers. The Volcan Santa Maria (Santiaguito) is the closest of the many volcanoes surrounding Quetzaltenango, being just 9 km / 6 miles to the south and easily reached by road, from Xela to Llanos de Pinal. The hike to the summit takes around three hours and the views across the valleys stretch as far as the Mexican border. The best view, though, is of the crater of Santiaguito itself, born when Santa Maria last erupted in 1902 and still growing. The narrow cobbled streets of the little town of Zunil wind up the hills on which the town is set from the banks of the River Salama. 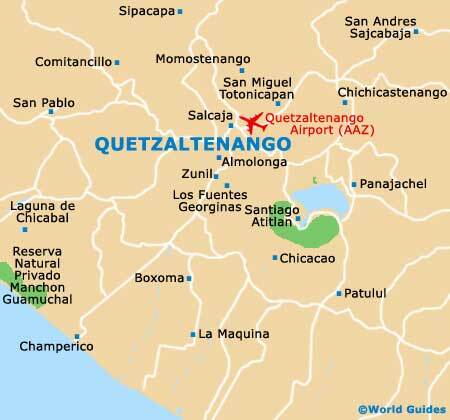 Established in 1529 and a mere 7 km / 4.5 miles south of Quetzaltenango, Zunil can be reached in just 15 minutes. Zunil is famous for its worship of San Simon, who is shared between the residents, with each taking turns to house the wizened image of the saint. A colourful market takes place here every Monday and each year on November 25th, the Festival of Santa Catarina Alejandri provides another good reason to visit. The Quetzalteco Plateau on which Quetzaltenango stands is ringed by a number of active and inactive volcanoes, lending themselves to walking and climbing expeditions. The city is known as a good base for exploration of these terrifying wonders of nature and many visitors come here just for the opportunity of getting close to their primeval presence. The constantly active Santa Maria Volcano (Volcan Santiaguito) and the massive Tajumulco Volcano (Volcan Tajumulco) have spectacular hikes, as well as almost endless views over the valley. Santiaguito measures in at some 1,400 metres / 4,593 feet, while Tajumulco is Guatemala's highest, at more than 4,200 metres / 13,780 feet in height. With Quetzaltenango being a famous centre for medicinal hot springs, the city is understandably surrounded by numerous related attractions, and the Los Fuentes Georginas resort gives the best experience of all. The main large rock pool nestles amongst steep, verdant tropical hillsides, where it is fed by hot sulphur springs, with the hottest water found closest to the rocks. Roughly a 15-minute drive from Zunil, the resort has a restaurant and changing rooms, but the overnight-stay rooms are scruffy. This tiny town is home to the oldest Spanish church in the country, the Iglesia de San Jacinto. Built in 1524 during the Spanish conquest of the region, the church boasts antique art works and an ornate altar, with various stone carvings adorning its facade. The town of Salcaja is some 9 km / 6 miles to the north-east and is also famous for its hand-woven textiles and two locally distilled liqueurs - 'Caldo de Frutas' and 'Rompopo'. Sited less than 20 km / 12 miles to the west , this breathtaking crater lake is sacred to the Maya people, and is set almost 3,000 metres / 9,843 feet above sea level, in the centre of an extinct volcano. Its brilliant emerald green waters lie a few hundred feet below its cloud-forest shaded rim. Around its shores are altars, candles and the remains of offerings. Worth noting, during the early part of May, visitor restrictions are often applied due to traditional Mam-Maya ceremonies taking place. Located in-between Salcaja and Cuatro Caminos, the small town of San Andres Xecul is surrounded by green fertile hills and countryside. The ornate church of San Andres Xecul is a major attraction here and well worth a visit for its beautiful interior. Further up the hill is another church with a stunning view across the valley to the mountains. This little place of worship is sacred for local Mayans, who hold ritual ceremonies and prayers here. Best known as Antigua, the city of La Antigua Guatemala lies just over three hours away, being 160 km / 99 miles to the south-east. This is the former capital city and features a vibrant culture, with many colonial buildings and attractions. Those visiting Antigua, now listed as a UNESCO World Heritage Site, will find plenty to see, including the Captain General's Palace, the Capuchin Convent, the City Hall and the Santiago Museum. The Volcan Pacaya is particularly close to Antigua and many people choose to climb this famous volcano to admire its crater. As the capital city, Guatemala City really does deserve an excursion, although is just a little to far for a day trip, being 200 km / 124 miles to the south-east of Quetzaltenango. The attractions of Guatemala City are certainly in plentiful supply, with some of the country's leading museums and lively entertainment offerings, especially around the Zona Viva area of Zona 10 and along the pedestrianised Cuatro Grados Norte. The lush 18,000-square metre / 193,750-square foot Jardin Botanico at the University de San Carlos is a much-visited attraction in Guatemala City, celebrating the diversity of flora found across the country, with a display of over 1,400 varieties. Many of the examples on display are from endangered species. Both local and exotic plants and trees are featured at these gardens, which are beautifully laid out with extensive paths through the colourful displays. Neighbouring Los Vahos has a variety of attractions and activities, with its hiking trails, scenic views and a rocky hillside complete with caves. However, most people come here for a session at the steam baths, which are open daily between 08:00 to 18:00 and provide a very memorable sauna experience, often involving leaves from eucalyptus trees. An indigenous and somewhat religious town only 6 km / 4 miles south-east of Quetzaltenango, Almolonga is best visited on a Tuesday, Thursday or Saturday, when its market is held, offering the chance to by the very freshest local produce. The Iglesia de San Pedro is an important sight in town and features an ornate altarpiece and a dramatic ceiling. Nearby, you may also like to visit the natural hot sulphur springs of Los Banos. The attractive highland town of San Miguel Totonicapan is called home by a particularly high concentration of artisans, who sell their quality goods locally. Each Tuesday and Saturday is market day, although this market is more suited to locals than sightseers. Pleasant hiking trails can be found at the Sendero Ecologico El Aprisco reserve, where you can often spot native hummingbirds, quail and other exotic birds. The elevated San Francisco El Alto town is only 17 km / 11 miles away and enjoys great views across the Quetzaltenango cityscape. It is the town's Friday Market that is the principal attraction, being one of the largest in Guatemala, and certainly amongst the most authentic and traditional. Market stalls are spread around the plaza fronting the town's 18th-century church, where you can buy all kinds of clothing and textiles. Held each year on October 4th, the Fiesta de San Francisco de Asis is a huge festival, with parties, music and dancing. Situated approximately 26 km / 16 miles to the north-east is Momostenango, a town set within a beautiful mountain valley. The various sights around the town generally relate to the Mayan culture, with the Maya Mission of Takiliben May Wajshakib Batz teaching the sacred traditions of this ancient civilisation. On the outskirts of Momostenango are the geological erosions of Los Ricos, which are within walking distance of the town centre.